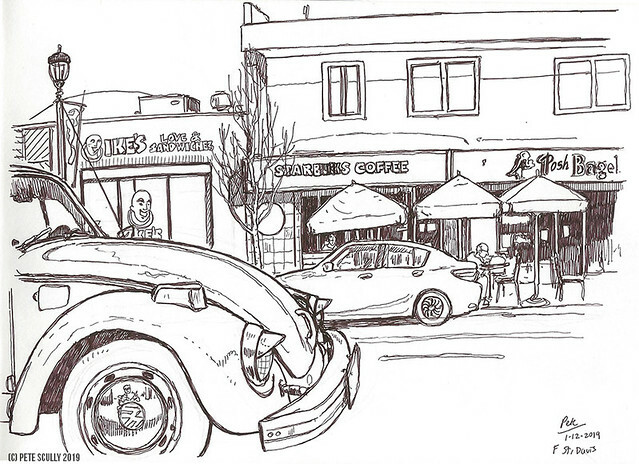 I sketched this downtown on F Street, but before I could colour it I got tired. I was going to colour it later, but again I got tired. So just imagine this, the colour of the Volkswagen in the foreground is bright orange. It was a very sunny afternoon. I was drawing very accurately, proud of my observational skills, wow look at this, I’m really getting it down, bisual measuring, effortless, and OH BUGGER I FORGOT THE “C” IN STARBUCKS. In my defense, I don’t drink coffee. But what the fuk? So I tried to shoehorn it in. Nobody will notice! It’s not like it’s one of the most recognized logos in the world. That might help actually, people don’t really look at it, they just see the font and go, “oh Starbucks”, in fact I could have written “Stervafks” or “Swppfghswiks” and people would have been like, “oh Starbucks”, but no I had to try to add it back in, I may as well have written it in bright red felt-tip pen. I don’t mind though. Americans routinely miss letters out of words, as in “donut”, “thru” and “color”. I got myself into the sketch, if you can spot me (no I am not the “Ike’s Sandwich” cartoon guy). That is where Tower records used to be, before it folded. It was also where the record store that came after it was, I used to go there a lot but now the name escapes me. Dimple, that was it. Starbucks/Starbuks has been there as long as I have lived in Davis, and I think Posh Bagel has too, I sometimes go there for a chocolate croissant. Anywy, hapy wekend, foks.